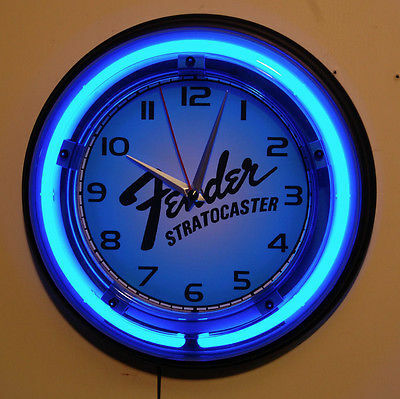 BRAND NEW IN THE BOX FENDER STRATOCASTER GUITAR NEON LOGO WALL CLOCK. AUTHENTIC NEON OPERATES ON HOUSEHOLD CURRENT WITH A 6′ CORD AND WALL TRANSFORMER INCLUDED. CORD HAS INLINE ON/OFF SWITCH. THE QUALITY QUARTZ BATTERY MOVEMENT OPERATES ON ONE AA BATTERY INCLUDED. BLACK PLASTIC FRAME WITH GLASS FACE COVER. MEASURES 11″ IN DIAMETER AND 2 1/4″ DEEP. INCLUDES WALL ANCHOR. BUYER TO PAY $ 8.00 SHIPPING TO CONTINENTAL US. MADE IN CHINA. FENDER GUITAR CUSTOM SHOP 2017 CALENDAR NEW SEALED STRATOCASTER TELECASTER 12" MADE IN U.S.A. Guitar neck for the Fender Stratocaster!! !